In an earlier post, I discussed the pitfall of using structs in C# to store data and failing to override the Equals method. In this post I’ll look at the GetHashCode method and how not overriding the default implementation can have a drastic effect on the performance of a C# application. I was asked by a client to investigate the performance of a C# WPF application; users were concerned that performance across certain areas just didn’t feel as fast as it ought to be – particularly during busy times of a trading day. After analysing the code and using an automated profile application (ANTS by Red Gate) I narrowed down the bottle neck to a struct had been used to store stock market prices. If you don’t want to read how these numbers were created, then the bottom line is, if you are using structs to store data and these structs regularly have their Equals or GetHashCode default methods called - either directly or indirectly (by storing in a Dictionary), then in terms of performance you should override the methods and implement your own Equals and GetHashCode methods. If you’re using a struct and you do not override the Equals or GetHashCode methods, then you’re deferring down to the default implementations. These are shockingly slow, as they use Reflection to look at the fields defined in your struct. 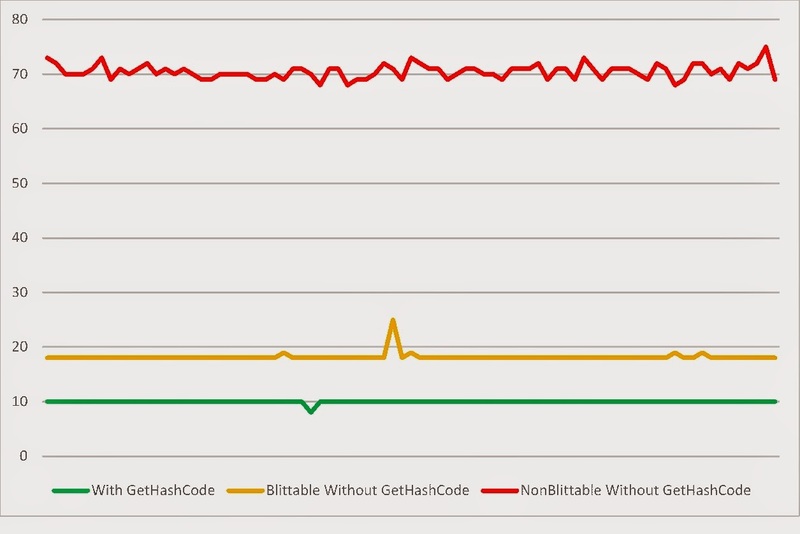 The chart below shows (times in milliseconds) how slow it can be by repeatedly calling GetHashCode on a struct that does/does not have the GetHashCode method overridden. The original application developer used a struct to store minute-by-minute stock market pricing data, rather than a class. Unfortunately, these structs did not to override the GetHashCode and Equals methods, therefore using .NET’s default values, which resulted in some rather surprising performance issues. Take a look at my Equals post for further details of Blittable and Non-Blittable Types . I’m going to walk through a selection of code snippets to show how much of a performance difference you can see by implementing GetHashCode. As part of my profiling samples, I’ve created a base class (TimedActionBase) that, when used in conjunction with NUnit and Resharper, makes it really easy to run snippets of test code with a single mouse click and provide a statistical average for the area under test. You’ll find a link to the code at the bottom of this article. You won’t need Resharper to compile the test code, but you’ll need to run Install-Package NUnit using the Package Manager Console to download and install NUnit from NuGet. I’ll just summarise the base test class here, as it’s the actual tests that are more important. Even if you aren't directly calling GetHashCode in your code, it is used by .NET when you use the objects in any of the Dictionary based collections. The numbers are very surprising. You can view similar results for the Equals performance test post.